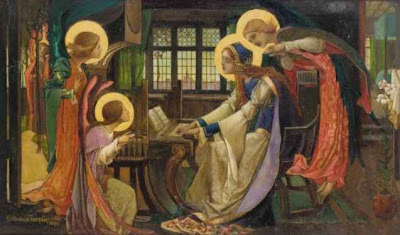 St Cecilia is believed to have lived in the 2nd or 3rd century as a chaste bride and Christian Martyr. Her attributes are flowers, since an angel watching over her is said to have placed crowns of lilies or roses on her brow, and musical instruments (she is the patron saint of music) particularly the organ as an early account of her life refers to music played on her wedding day. She and her husband were later imprisoned and executed. The present, earlier painting, represents an important stage in Frampton’s development of a subject that was to prove central to his art. The picture is an unusual interpretation of the subject without the usual view of the sea from the towered battlements. However, the presence of the angels and the inclusion of the organ at the centre of the composition makes Frampton’s subject clear.